I don’t know about you but my ‘things to do’ list grows daily yet no matter how much I try to keep on top of it there are always things which I note as ‘I’ll do that tomorrow.’ Complete my PC backup successfully was inevitably always one of these things until I subscribed to a cloud PC backup system. Thanks to the features of Avandrive Cloud Backup and Storage, I can finally cross ‘Complete my pc backup’ off of my list. Automated backup is a standard feature of Avandrive, after installation you can programme your PC to backup as frequently as you require. Whether it is on real time basis or on scheduled basis, online Avandrive means you never have to worry about data loss as all your files will have been backed up to the cloud. But this isn’t the only advantage to Avandrive. By backing up or storing my files online, I can access them via any internet ready device. This feature helps me cross multiple things off of my ‘things to do’ list. I no longer have to remember to email myself files from home to the office or transfer them to a USB stick, lend it to someone and then remember to get it back. Another thing I can cross off my list of ‘things to do’ courtesy of Avandrive is ‘send my Mum my holiday snaps.’ Avandrive has a file sharing feature which means instead of having to upload each photo, one by one and email them across to her, I can send her one email with a URL on it, which will allow her access to them all, which she can peruse at her leisure. 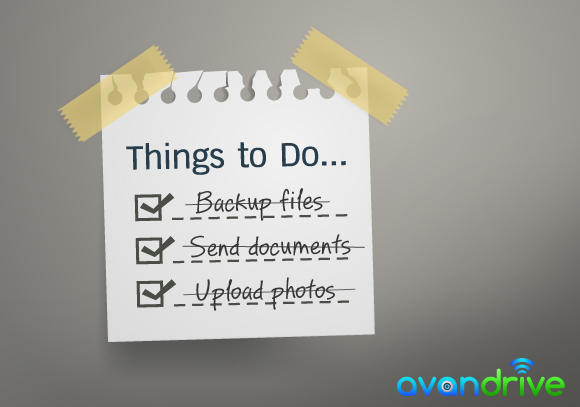 ‘Things To Do’ lists are the bane of modern day life but Avandrive can help you cross off more than one item!